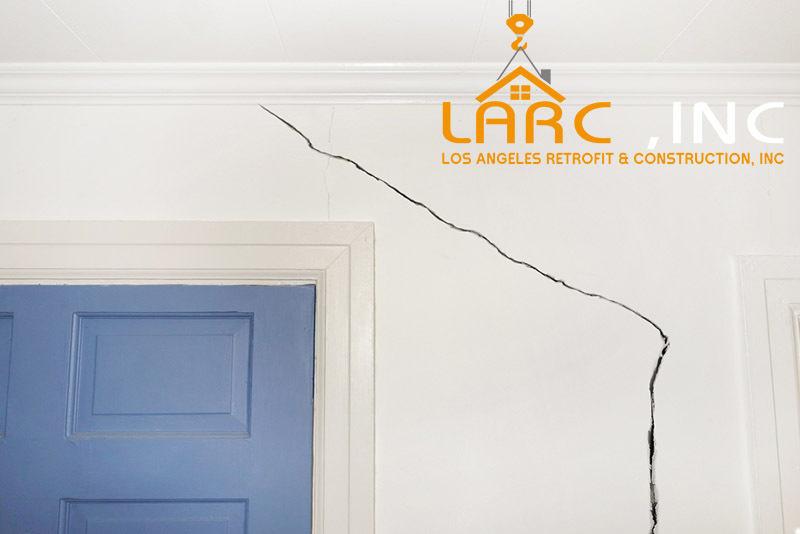 Foundation repairs can run the gamut from simple fixes to major reconstruction. Weather can be the biggest culprit having a major impact due to varying temperatures and precipitation throughout the year. For instance, if your foundation is too dry due to drought weather, this can cause the soil to contract and lead to cracks. If your area has had a heavy rain season, this can cause your foundation to sink or cause the soil to expand and push on basement and foundation walls. If you detect the warning signs early enough, it can save you thousands of dollars down the line. Here are some sure signs that it’s time to consider some kind of foundation repair for your home, whether it be mild or severe. If you notice your floor is on an angle, than your foundation is probably slanted or tipped and requires substantial reinforcement to prevent further deterioration. This requires repairing the walls from the inside with wood or steel braces, carbon fiber mesh or wall anchors that can block further movement. These walls will intrude into the basement area making it difficult to finish the walls. A newer almost invisible option involves spreading epoxy in vertical strips, then pressing on carbon fiber mesh to lock the wall in place. The most common culprit is water. It can accumulate in the soil around the foundation causing the soil to expand and add pressure on walls and foundation footings resulting in cracks inside and outside of your home. If your foundation has cracks wider than ¼ inch wide or if you have stair step cracks in blocks or bricks, you can hire a contractor to plug them by injecting epoxy or do it yourself. This will stop running water from coming in and prevent any further damage. Most foundations are required to have a perimeter drain system that channels subsurface water away from the foundation. If this drain becomes blocked, it can cause water to accumulate in the soil causing additional pressure on your foundation walls. If you suspect a blocked drain, it is best to call a professional to unclog it. When a foundation wall bows more than three inches, you may need wall anchors which are similar to large bolts that consist of metal plates. The connectors are gradually tightened to stabilize and help straighten the wall. This is a sure sign that you have some major damage and will probably need to excavate part or all of your foundation at some point and rebuild it. If a broken water pipe, plugged up gutter or drainage problem in your yard has sent droves of water cascading alongside the perimeter of the foundation and has undermined an area, a contractor may be able to shore up the area with more concrete or shim the sill plate to make the area level again. Or you might need to tear out a section of the foundation, re-pour and tie the new section into the old with rebar and epoxy. If you notice your doors are sticking or not closing properly, this could very well indicate a problem in your foundation. Gaps at the top of the door often happen because the foundation has settled. Leveling the foundation can fix the problem. Many people don’t realize these little nuances are due to a possible sinking foundation and try to fix the problem by adjusting the door jamb. This may appear to be a temporary solution but in reality, you could have a much more serious problem going on underneath your home. 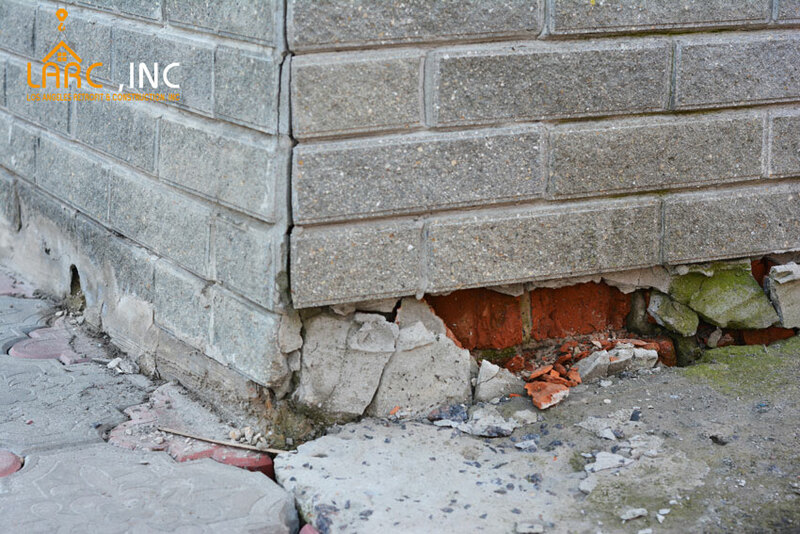 There are several probable causes that make your foundation settle including ground movement, drainage problems or poor construction. If you find this to be the case, it’s probably best to call in an expert to assess the extent of your current damage. If you notice that sticking windows become problematic, you can be pretty sure you have a foundation issue. A common underlying problem that often causes this is also a sinking foundation. When this happens, most likely you will have to level the foundation to help realign the window frames. Helical piers and tiebacks, wall anchors, push piers and plate anchors are some of the ways a professional contractor can correct the problem for you. Although you may be able make some more simple repairs to save some money in the short term, it could cost you more in the long run if you don’t fix the root cause of the problem. A simple repair will only last for so long and by not fully repairing the area may end up causing further damage. The best way to avoid foundation issues is to plan ahead by making sure you have landscaping that slopes any water away from your home and good gutters to redirect water down the driveway.